Lyposmol makes available to different medical specialties a viable, safe, legal and profitable tool in the field of regenerative medicine within the so-called “TRANSFER LAPTOP”. Where all patients can access regenerative medicine with the utmost safety and effectiveness, in the same surgical event with short, medium and long term results. The 8 existing cell groups in SVF are obtained, with high number of live ADSCs and no apoptosis. Enzymatic reagent developed by Lyposmol with the highest quality, effectiveness and optimization in obtaining SVF. Lyposmol ADSC System® developed according to Spanish and European legislation. Enzymatic reagent packaged in clean room N5 White and fulfilling Ph. Eur. Performed in the same surgical act and without substantial manipulation. Standard Work Procedure included in the kit. Operating room ambulatory minor surgery. Immediate Therapy, Same Surgical Act. The best cost / effectiveness of the market. Total treatment time >< 90min. EKC® system included in the kit for checking absence of enzymatic activity before each implant SVF and “in situ”. Products developed to the highest quality standards in the market. Closed system with no risk of contamination. 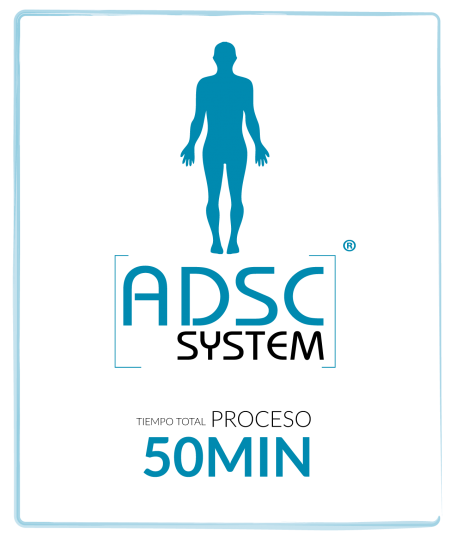 Biosafety studies, own and by external laboratories, guarantee the Lyposmol ADSC System® process.